Today in Sonoma on Broadway outside the post office I saw two suspected Tea Party activists with “Impeach Obama” posters hawking for votes, no problem – except they were displaying posters with Hitler’s ugly moustache on Obama’s face. I complained to both the women at the table, saying, “I think that’s disgusting.” As I walked away I saw there was a woman also walking away obviously distraut, I think she was jewish. She was crying, whispering to herself “That’s so disgusting” In the post office, she was inside, sobbing her eyes out. I said to her “That upset me also, I told them what I thought, and used a finger” I stewed a bit, then marched back to the table, irate, livid, steaming and intent on mayhem. I grabbed a poster with both hands and ripped it down, grabbed a second and tore it away too. Then marched off, a proud Ripper, saying to myself, “My grand-dad died in Auschwitz, I’ll be damned if I don’t avenge his memory.” The two at the table started to video me, and called the police, complaining that I’d violated their first ammendment rights. I said, “Go ahead, I’ll be pleased to curse you in court.” We drove away, adrenaline coursing through my veins, elated that I’d won one for the Ripper. As an added note to the above, later in the day just as I was about to about to speak to to the the man in the frame shop next to the post office and ask him, “What do you think of the Hitler posters?” he said exacty the same thing to me,”What do you think of the Hitler posters?” When I told him what I had done, he grinned, and shook my hand. 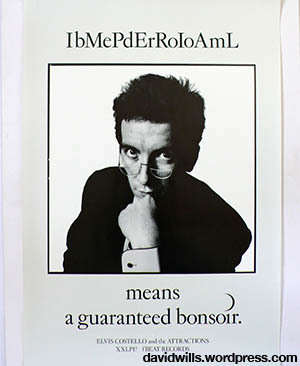 That evening I spoke with another guy, proudly telling him what I had done, he also responded,by shaking my hand, and added that if he saw the poster – he’d burn it. Along with the rest of my jetsom that disapeared down the memory hole over the years were two silver spoons given to me at birth in December 1941. One was from Alan Turing, he of Enigma fame, the master codebreaker Churchill credited with making the biggest single contribution to the Allied victory over Hitler. The other spoon was given by Turing’s boss, RV Jones, Churchill’s choice for scientific advisor to the War Effort – and my godfather. Both spoons had my initials engraved on them, each set of initials in different type styles. As a kid I marvelled at the intricate characters. I realized this morning that my intense interest in these monograms was the inspiration for me to be a graphic designer. To have had such a spoon-fed gift at the height of the blitz was truly extraordinary. My dad, CSWiIls, BSc, was at that time working as a scientific officer at the experimental aerodrome in Farnborough, Surrey, England, which is how he came to know such prestigious people. He was working with Jones on early radar and playing chess with Turing. In another interesting connection, one of my middle names is Christopher, I am thus named for Turing’s boyhood chum, Christopher Morcom, whom he idolized and who died when he was twelve. I am currently reading RVJones book, The Wizard War, 1978, which is the true story of how to do a good job and beat the Nazis. In my new home town of Sonoma in Sonoma County, CA, USA, as my heart-throbber Tamala and I were jaunting off to Costco on a saucy shopping spree for knickers and bra, when we saw smoke, white, that told of a grass fire. But soon the smoke turned an ominous black, curdling the sky with a plume of uncontrolled terror. We were diverted away from the scene by cops who closed the road. But soon our journey took us to a vantage point that gave us a view straight out of a movie. There before us, across the road was the blaze. There were helicopters dropping water scooped from nearby ponds. We drove on, with the belching coal-black smoke roiling in clouds drifting over the Bay-Area. Suddenly… “Oh my god – look at that!” I screamed. 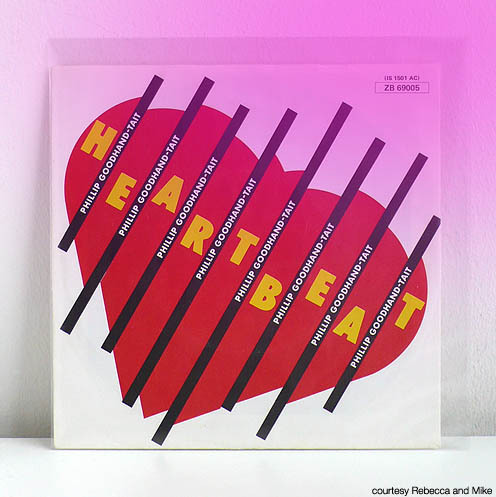 With Valentine’s Day approaching, and matters of the heart coming to the fore, here displayed for your timely appreciation is Barney Bubbles’ sleeve for Phillip Goodhand-Tait’s 1983 single ‘Heartbeat’. A track originally recorded by Buddy Holly, an icon Barney was happy to often parody in his graphixeffex. My London correspondents (whom I thank for the image) tell me this was one of the last sleeves Barney designed.